Nature is cruel. At its most basic level, the humanity expressed in The Revenant seems to be designed to accomplish one thing and one thing only: survive at all costs. The film, directed by Oscar-winning Alejandro Inarritu, is a 150-minute long examination on brutish, dog-eat-dog survival with impeccable visceral and cinematic detail. Set in early 1800’s, a group of trappers lead by Captain Andrew Henry (Domhnall Gleeson) are making their way through the wintery Montana landscape with a load of valuable pelts. Among the party are Hugh Glass (Leonardo DiCaprio), an experienced mountain man with tribal ties to local Native Americans, his son Hawk (Forrest Goodluck), and John Fitzgerald (Tom Hardy), a short tempered man with a particular disdain for natives. It’s clear right off the bat that these are hardened men in desperate times. In what may be one of the greatest opening battle sequences of all time, the group is ambushed by an Arikara hunting tribe, leaving multiple deaths on both sides. Desperate for supplies, the group must now travel through the snowy wilderness towards a nearby outpost, all the while trying to survive the threats from the harsh elements, native american hunters, wild animals, and each other. Shot beautifully by veteran cinematographer Emmanuel Lubezki (The Tree of Life, Birdman), The Revenant is becomes more breathtaking and visually complex with each passing moment. Like fellow Mexican director Alfonso Cuaron (Children of Men, Gravity), Inarritu seems to have become fond of the long-shot, utilizing Lubezki camerawork to create a fully immersive and naturalistic narrative experience. By avoiding as much CGI as possible, the cast and crew painstakingly suffered through a lengthy, 9-month production phase where some allegedly ate, slept, and lived like their character counterparts for months on end. 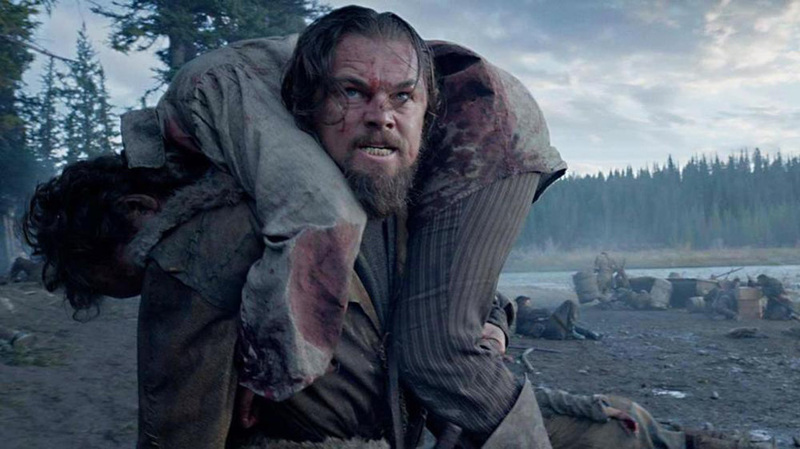 DiCaprio said some scenes were “some of the most difficult things I’ve ever had to do. Whether it’s going in and out of frozen rivers, or sleeping in animal carcasses, or what I ate on set. [I was] enduring freezing cold and possible hypothermia constantly.” Aledegy, The Revenant far exceeded and nearly doubled its production budget. All this dedication from the cast crew does payoff, with the end result being an absolutely brutal and realistic look into nature’s dark side. Inarritu is no stranger to suffering, with many of his previous films (21 Grams and Biutiful in particular) focusing in on the emotional impact of human sorrow. But in The Revenant, that suffering becomes more physical, intimate, and raw as we accompany one character’s journey to seek revenge after enduring hellish depths of physical and emotional pain. Inarritu knows how to foster incredible performances from his actors (DiCaprio is great as always, but Tom Hardy truly puts on a show), that, when combined with visual elements, create a compelling and rich story. At its core, it’s a man vs nature survival story, but The Revenant does show off a deeper, even spiritual side of the hellish nature. Bottom Line: Expertly-directed with incredible attention to detail, The Revenant is a visceral, immensely rewarding, and near-spiritual experience, while still somehow equally as harrowing, ruthless and painful. Ewan Mcgregor plays the characters of Satan and Jesus in this Biblical adaptation of Matthew 4. If you recall from Sunday School, this is the part in the New Testament where Jesus fasted for 40 days and becomes tempted by Lucifer to use his godly powers to feed himself. Directed by Rodrigo Garcia, and shot by the Academy Award winning Emmanuel Lubezki, Last Days In The Desert is a magnificent display of one man’s search for meaning and spiritual fulfillment. Unfortunately, the audience is left searching for meaning as well, as the plot of the film becomes so thinned out it is lost in the vivid details of the desert scenery, proving Last Days to be nothing more than an exercise in style over substance. The film starts with Jesus wandering majestical desert scenery after a long prayer. “Father, where are you?” he asks, questioning his role in God’s mighty plan. After a few surreal encounters, our wanderer stumbles upon a small unnamed family who has just left Jerusalem in order to excavate nearby rocks. The family is lead by a patriarchal figure played by Ciaran Hinds, who dying wife (played by Ayelet Zurer) and questioning son (Tye Sheridan) come to Jesus in the middle of a crisis. Jesus decides to try and help this family, as a way to resolve his continuing annoyances from the Devil and reconcile with his Heavenly Father. Sheridan and Hinds’ characters are also in the midst of a father-son dilemma; the older wanting to stay secluded from society in the desert, and the younger wanting to go and learn a trade in the city. There are few cinematographers working today who have quite the legacy of Lubezki (Google “best cinematography” and you will get at least three of his films on the first page), and his brilliant eye works wonders for the desert scenery. Long, empty, and distant shots of towering sand dunes are contrasted with busy close-ups of desert wildlife. With such few characters to work with, Lubezki is left with the daunting task of using nature to evoke emotional responses. We see a bloodthirsty pack of wolves, violent rivers, sinister insects, and jagged cliff sides. While it does look grandiose and vivid, the content and story of Last Days In The Desert remain hollow and frustratingly empty. Though the film clocks in at 98 min, the extreme long shots and lack of dialogue make it feel more like 150. Garcia never gives the audience enough substance to chew on, and that could be perhaps the his biggest sin here.